From left to right, Philadelphia Union sporting director Ernst Tanner, chief business officer Tim McDermott and manager Jim Curtin during Thursday’s Q&A session with fans at Talen Enregy Stadium. 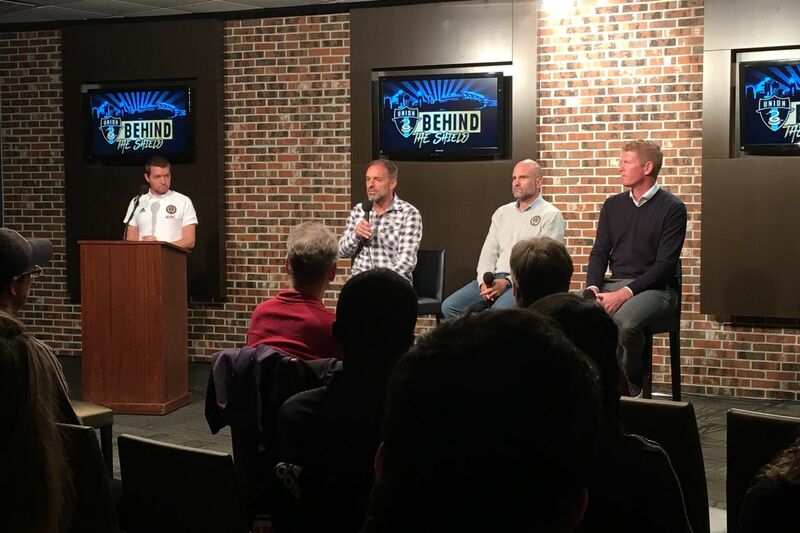 On Thursday night, Union sporting director Ernst Tanner, manager Jim Curtin and chief business officer Tim McDermott hosted a town hall-style question and answer session with fans at Talen Energy Stadium. Here are some highlights from their remarks, edited lightly for clarity. You can watch a replay of the entire event on the Union's Facebook page. My experience is it has never been sustainable if you do a one-time, initial investment, and then you are not focused on keeping on working. Most of the time, you need to do a second investment and even a third investment to keep that level you have. I think it is dangerous in a way for a league, and it could be increasing the level of wages, which even harms the normal level of the league. That's a big discussion which is going on in Europe. You might know the German 50+1 rule where they try to avoid this exactly: that you can buy success by investing so much money. It also influences competition in a way which is not necessarily sporting. I'm rather convinced of sustainability, continuously working, and then you will be successful as well by the end. That is the way we should focus on. I think that basically, the mentality of American kids here, the players here, is very good. We need to direct them a little bit more on the necessary dirty work on the pitch. That is to do with defending. I can understand the culture here, when everybody is watching Real Madrid, Barcelona, Manchester United and City, and nowadays, Jurgen Klopp's Liverpool. Somebody might see that there is a difference in what Jurgen is doing to what Barcelona maybe is doing at the moment, and he is successful doing that. I can imagine that the game, what we do with the ball, is so super-exciting that we forget a little bit the dirty part of the game. But that is what will make us successful, if we know how to play it. We need to change a little bit the mindset. … I've seen a very good picture of our academy director last week, where he had the All Blacks, the rugby team from New Zealand, and the line [quoted from them] was, "We are loving when we don't have the ball." That says a lot about the real secret of the game. That's what we need to focus more on in order to separate a little bit from the rest. And for sure we need to bring in better talent. We need to bring in better talent via our scouting and recruiting department. That's what we are just reorganizing. We are not doing so bad in the first team — we have clear values, clear indicators where they are going to. We are doing a lot of data. But even here we need to explore markets where you can get players where others don't go. In the academy side, we need to focus a bit more on the region, and we also need to go in spots where no homegrown zone is. We already have some players in the academy, out of Florida for instance, who we will see in the first team. I'm pretty sure about that, in the near future. But that's what we need to develop and work on. Win games. We are in professional football. Nobody is interested in philosophy, in the game model. Everybody is interested in what is happening on Saturday, hopefully, on the pitch there. And that's what we need to respect. So we need to have the best roster we can have. We need to do the best work on the training pitch. We need to focus on every single game in order to win it. And for sure, we are going to change some things, because football also has changed. We have a model which is really good, but it is mainly based on passing and positions. Football is going more in the direction — has gone more in the direction — that we need to get into the transition game. Because that will make a big impact, especially here [in MLS] where it is not that well-known. That's the model we are going to follow on. But to implement it will not happen tomorrow, I can promise you. We did the same in [Red Bull] Salzburg, and it took us two years at least to implement it. The first year, we exchanged the whole team, almost, and in the first year we were not winning the championship. We were dropping out in the semifinal of the [Austrian] Cup. And by the end of the season, everybody was asking if the coach was the right one. But that was the start of a very successful project, and I think we can do the same here. It happens a couple times a season, but I'm not a coach that goes to that well every game. Because players become numb to it. They don't believe it. You have to pick your moments for that. I'll have a good one ready to go for our playoff game, that's for sure. Maybe R-rated. But the guys are a group that has trust and belief in each other, and that's the most powerful thing. They've done their talking on the field. We don't have a lot of guys that talk about themselves in the press, like maybe you see on other teams. … I'm really proud of the work our staff has done, and the players on the field deserve all the credit this year. They don't need too much yelling and screaming from me. We're in discussions with them about what would that look like if they were to use Bimbo on the jersey or another brand on the jersey. The new rules in MLS allow you to basically put a brand on a home jersey and a different brand within the same parent company on the away jersey. Those allow us some flexibility, and it's something that might be interesting for Bimbo. We're in discussions with them, and then as you might expect, we're also, you know, kind of exploring other opportunities as well. It's early on. I've often asked myself, if there was a YSC-like facility, an indoor-outdoor facility, a multi-sport facility that was here, what would that look like? It think it would be a great draw for a lot of the adult soccer players who play in Philadelphia, but it could also be a great draw for youth soccer tournaments and leagues, so on and so forth. It's just one idea. There could be three, four, five others. We actually are in the process of trying to go through kind of vetting out what this looks like. We're very close to hiring an architectural firm that will also do some work with us on understanding what might be some business ventures that could thrive here. And again, aesthetically, what do we do to make this area come to life a little bit more. It's a ten-year plan, so to speak. It's not going to change overnight. But we recognize that we have this land, and we think there are some opportunities for some business ventures to populate on the land here.